For the mythical king of the Yadava dynasty, see Vajra (king). "Dorje" redirects here. For the UK progressive metal band, see Dorje (band). A vajra is a weapon used as a ritual object to symbolize both the properties of a diamond (indestructibility) and a thunderbolt (irresistible force); the Sanskrit word has both these meanings. The vajra is essentially a type of club with a ribbed spherical head. The ribs may meet in a ball-shaped top, or they may be separate and end in sharp points with which to stab. The vajra is the weapon of the Indian Vedic rain and thunder-deity Indra, and is used symbolically by the dharma traditions of Buddhism, Jainism and Hinduism, often to represent firmness of spirit and spiritual power. According to the Indian mythology, vajra is considered as one of the most powerful weapons in the universe The use of the vajra as a symbolic and ritual tool spread from India along with Indian religion and culture to other parts of Asia. According to Asko Parpola, the Sanskrit Vajra- and Avestan Vazra- both refer to a weapon of the Godhead, and are possibly from the Proto-Indo-European root *weg'- which means "to be(come) powerful." It is related to Proto-Finno-Uralic *vaśara, "hammer, axe", but both the Sanskrit and Finno-Ugric derivatives are likely Proto-Aryan or Proto-Indo-Aryan, but not Proto-Iranian, state Parpola and Carpelan, because of its palatalized sibilant. The earliest mention of the vajra is in the Rigveda, part of the four Vedas. It is described as the weapon of Indra, the chief among Gods. Indra is described as using the vajra to kill sinners and ignorant persons. The Rigveda states that the weapon was made for Indra by Tvastar, the maker of divine instruments. The associated story describes Indra using the vajra, which he held in his hand, to slay the asura Vritra, who took the form of a serpent. 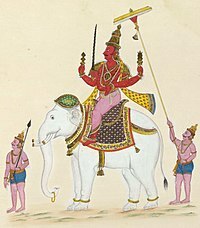 On account of his skill in wielding the vajra, some epithets used for Indra in the Rigveda were Vajrabhrit (bearing the vajra), Vajrivat or Vajrin (armed with the vajra), Vajradaksina (holding the vajra in his right hand), and Vajrabahu or Vajrahasta (holding the vajra in his hand). The association of the Vajra with Indra was continued with some modifications in the later Puranic literature, and in Buddhist works. Buddhaghoṣa, a major figure of Theravada Buddhism in the 5th century, identified the Bodhisattva Vajrapani with Indra. Many later puranas describe the vajra, with the story modified from the Rigvedic original. One major addition involves the role of the Sage Dadhichi. According to one account, Indra, the king of the deva was once driven out of devaloka by an asura named Vritra. The asura was the recipient of a boon whereby he could not be killed by any weapon that was known till the date of his receiving the boon and additionally that no weapon made of wood or metal could harm him. Indra, who had lost all hope of recovering his kingdom was said to have approached Shiva who could not help him. Indra along with Shiva and Brahma went to seek the aid of Vishnu. Vishnu revealed to Indra that only the weapon made from the bones of Dadhichi would defeat Vritra. Indra and the other deva therefore approached the sage, whom Indra had once beheaded, and asked him for his aid in defeating Vritra. Dadhichi acceded to the deva's request but said that he wished that he had time to go on a pilgrimage to all the holy rivers before he gave up his life for them. Indra then brought together all the waters of the holy rivers to Naimisha Forest, thereby allowing the sage to have his wish fulfilled without a further loss of time. Dadhichi is then said to have given up his life by the art of yoga after which the gods fashioned the vajrayudha from his spine. This weapon was then used to defeat the asura, allowing Indra to reclaim his place as the king of devaloka. Another version of the story exists where Dadhichi was asked to safeguard the weapons of the gods as they were unable to match the arcane arts being employed by the asura to obtain them. Dadhichi is said to have kept at the task for a very long time and finally tiring of the job, he is said to have dissolved the weapons in sacred water which he drank. The deva returned a long time later and asked him to return their weapons so that they might defeat the asura, headed by Vritra, once and for all. Dadhichi however told them of what he had done and informed them that their weapons were now a part of his bones. However, Dadhichi, realising that his bones were the only way by which the deva could defeat the asura willingly gave his life in a pit of mystical flames he summoned with the power of his austerities. Brahma is then said to have fashioned a large number of weapons from Dadhichi's bones, including the vajrayudha, which was fashioned from his spine. The deva are then said to have defeated the asura using the weapons thus created. There have also been instances where the war god Skanda (Kartikeya) is described as holding a vajra. Skanda is also the name of a bodhisattva in Mahayana Buddhism who wields a vajra. In Tantric Buddhism (Vajrayana) the vajra and tribu (bell) are used in many rites by a lama or any Vajrayana practitioner of sadhana. The vajra is a male polysemic symbol that represents many things for the tantrika. The vajra is representative of upaya (skilful means) whereas its companion tool, the bell which is a female symbol, denotes prajna (wisdom). Some deities are shown holding each the vajra and bell in separate hands, symbolizing the union of the forces of compassion and wisdom, respectively. In the tantric traditions of Buddhism, the vajra is a symbol for the nature of reality, or sunyata, indicating endless creativity, potency, and skillful activity. The term is employed extensively in tantric literature: the term for the spiritual teacher is the vajracharya; one of the five dhyani buddhas is vajrasattva, and so on. The practice of prefixing terms, names, places, and so on by vajra represents the conscious attempt to recognize the transcendental aspect of all phenomena; it became part of the process of "sacramentalizing" the activities of the spiritual practitioner and encouraged him to engage all his psychophysical energies in the spiritual life. An instrument symbolizing vajra is also extensively used in the rituals of the tantra. 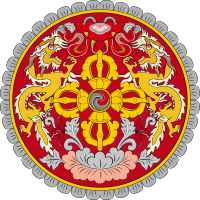 It consists of a spherical central section, with two symmetrical sets of five prongs, which arc out from lotus blooms on either side of the sphere and come to a point at two points equidistant from the centre, thus giving it the appearance of a "diamond sceptre", which is how the term is sometimes translated. Various figures in Tantric iconography are represented holding or wielding the vajra. Three of the most famous of these are Vajrasattva, Vajrapani, and Padmasambhava. Vajrasattva (lit. vajra-being) holds the vajra, in his right hand, to his heart. The figure of the Wrathful Vajrapani (lit. vajra in the hand) brandishes the vajra, in his right hand, above his head. Padmasambhava holds the vajra above his right knee in his right hand. The bell is the most commonly used of all musical instruments in tantric Buddhist ritual. The sound made by the bells is regarded as very auspicious and is believed to drive out evil spirits from where the ritual is being performed. When the bell is being used with the dorje its use is varied depending on the ritual or the mantras being chanted. During meditation ringing the bell represents the sound of Buddha teaching the dharma and symbolizes the attainment of wisdom and the understanding of emptiness. During the chanting of the mantras the Bell and Dorje are used together in a variety of different ritualistic ways to represent the union of the male and female principles. The vajra is made up of several parts. In the center is a sphere which represents Sunyata, the primordial nature of the universe, the underlying unity of all things. Emerging from the sphere are two eight petaled lotus flowers. One represents the phenomenal world (or in Buddhist terms Samsara), the other represents the noumenal world (Nirvana). This is one of the fundamental dichotomies which are perceived by the unenlightened. The physical manifestation of the vajra, also called dorje in this context, is the male organ. Arranged equally around the mouth of the lotus are two, four, or eight creatures which are called makara. These are mythological half-fish, half-crocodile creatures made up of two or more animals, often representing the union of opposites, (or a harmonisation of qualities that transcend our usual experience). From the mouths of the makara come tongues which come together in a point. The hollow of the bell represents the void from which all phenomena arise, including the sound of the bell, and the clapper represents form. Together they symbolize wisdom (emptiness) and compassion (form or appearance). The sound, like all phenomena, arises, radiates forth and then dissolves back into emptiness. Param Vir Chakra, India's highest war time military decoration has a motif of Vajra, the mythic weapon of Indra created by the bones donated by sage Dadhichi, as tribute to his sacrifice. In the role-playing game Dungeons & Dragons a dorje is a one-handed weapon for bludgeoning. ^ Parpola & Carpelan 2005, p. 118. ^ Asko Parpola 2015, pp. 63-66, 114. ^ Douglas Q. Adams (1997). Encyclopedia of Indo-European Culture. Routledge. p. 112. ISBN 978-1-884964-98-5. ^ a b "The Great Sage Dadhichi". Archived from the original on April 21, 2007. Retrieved 2009-09-20. ^ a b "Dadhichi Rishi". Retrieved 2009-09-20. ^ Beer, Robert (1999). The Encyclopedia of Tibetan Symbols and Motifs, Shambhala, Boston. ISBN 978-1570624162. ^ Vessantara (2001). The vajra and bell, Birmingham. ISBN 978-1899579419. ^ "The Bell and the Sound Symbols of Dharma"
^ Satyindra Singh (20 June 1999). "Honouring the Bravest of the Brave". The Tribune, Chandigarh. Retrieved 2014-08-13. ^ Sumit Walia (Jan 23, 2009). "The first Param Vir Chakra". Sify.com. Retrieved 2014-08-13. Parpola, Asko; Carpelan, Christian (2005). Edwin Francis Bryant; Laurie L. Patton (eds.). The Indo-Aryan Controversy: Evidence and Inference in Indian History. Routledge. ISBN 978-0-7007-1463-6.